Recently, Ramon AFB's service members witnessed an unusual sight – two "Chinook" (CH-47) tandem rotor helicopters appeared over the airbase. They were joined by black "Apache" and "Apache Longbow" attack helicopters, all of them belonging to the Hellenic Air Force, which arrived at Ramon AFB for a joint exercise with the IAF's Helicopter Division. IAF squadrons participating in the three-day exercise were the 118th ("Night Riders") Squadron, which operates "Yas'ur" (CH-53) helicopters from Tel-Nof AFB; the 190th ("Magic Touch") Squadron, which operates "Peten" (Apache) attack helicopters from Ramon AFB; and the 113th ("Hornet") Squadron, which operates "Saraf" (Apache Longbow) helicopters from Ramon AFB as well. Crews from both air forces flew in southern Israel and familiarized themselves with the airspace before drilling flight under threat. "The exercise's main goal was to strengthen the cooperation with the Hellenic Air Force", said Lt. T', an exercise officer at the 190th Squadron. The IAF's Helicopter Division has a fertile cooperation with its Greek counterpart, and a similar exercise occurred in Ramon AFB in 2015 alongside Hellenic Air Force helicopters. "As a result of the close cooperation between Israel and Greece over the past decade, the two countries' military forces began cooperating more closely as well", said Lt. Col. Konstantinos Pappas, the Hellenic force's exercise leader and commander of an "Apache" (AH-64A) squadron. Maintaining the IAF's ability to train in unfamiliar territory and displaying the air force's strength are only some of the reasons for the cooperation: "The cooperation can't be estimated, but it is significant and useful", elaborated Col. G', Commander of Ramon AFB. "Everything is planned meticulously – from the reception for the Greeks when they arrive, through how the sorties are planned, and to the level of debrief". Alongside the Hellenic Air Force helicopter division's visit to Israel, Ramon AFB's fighter jet squadrons participated in an aerial exercise in Greece meant to improve both sides' operational capabilities via mutual learning. "The cooperation allows both sides to learn modes of operation different to those they are familiar with", added Lt. T'. "Each mission was allotted two different training fields, so we were able to fly in parallel with the Hellenic Air Force instead of separately. We did this in order to see how each force performs the mission, and then held a discussion in the following debrief". The fact that both sides have an A-model "Apache" is a significant factor for the exercise. "We are among the only countries in the world who have this model", emphasized Lt. Col. Pappas. "We're trying to see how we can make it operate better, as well as how we can keep it maintained for a longer period of time, which is useful". Lt. Col. T', Commander of the 190th Squadron, said that the Greeks are interested in how a professional, experienced air force operates. "I'm certain that the technical aspects are of interest to them as well – how we maintain our aircraft throughout the years and conserve their fitness level". 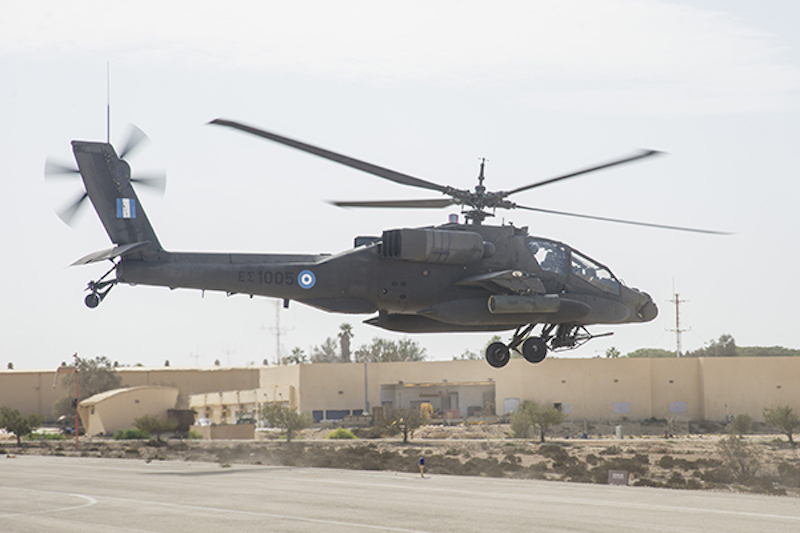 The missions faced by the IAF aren't too different from the challenges faced by the Hellenic Air Force, as Lt. Col. Pappas said: "As an attack helicopter pilot, I perform defensive and offensive missions. There are tactical differences in the way we perform missions with the ground forces, but they are small". Language was a central challenge for the participating crews. "We speak English, but it is neither our or their native language. Our mode of communication is professional, so discourse is complicated", described Lt. Col. T'. "It's not like flying alongside another pilot from the squadron. You don't know what airspeed they fly in, what distance they keep and what they say on the radio. This is why we aimed to produce simple drills which will enable communication, understanding and mutual learning. We want to learn from pilots who fly the same aircraft we do and hear about their combat doctrines and modes of flight. The missions are the same missions – transport helicopters carry and extract forces, attack helicopters assist in offense and defense – but the mode of operation is different". "We are happy to cooperate with the Israeli Air Force, not only during the exercise itself but also during the planning stage", concluded Lt. Col. Pappas. "The Israeli and Greek aircrews' mentality is similar, and this is a basis from which cooperation can only develop. I can't wait to fly with the Israeli partners next year in Greece".